Prior to opening Waypoint Property Inspection East in 2006, Mark Wahl spend over 20 years in the insurance industry specializing in Claims and Risk Management services for both personal and commericial clients. He studied Business Management while attending the University of South Florida and Raritan Valley College. Mark’s prior work experience has given him the knowledge he now uses when working with his client’s. He ability to deliver the inspection information with care has endeered him to his clients and their realtors. 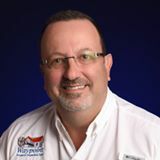 Mark’s committment to his clients has been a foundation to his business operating principles and why Waypoint Property Inspection East is Southeast Florida premier home inspection firm.